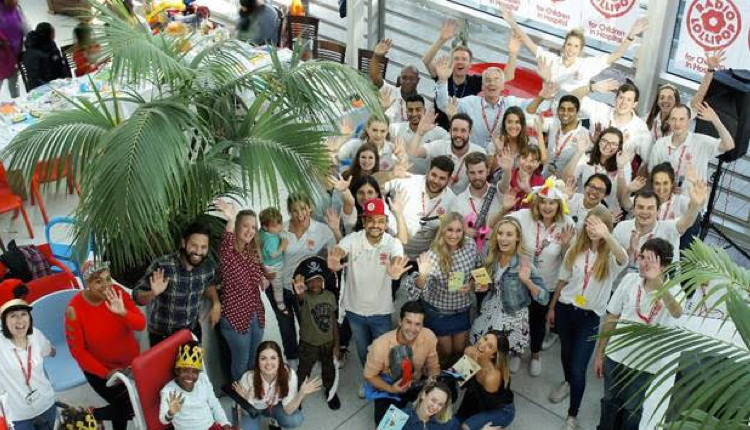 Radio Lollipop celebrated 10 years of entertaining the Evelina London Children’s Hospital by holding an end of Summer indoor festival for the children, volunteers, staff, parents and siblings last weekend. Experienced music-in-healthcare practitioners Zoe Konez & Marina Tiffeny, who specialise in bringing live interactive music for wellbeing into hospitals, kicked off the day, letting kids have a go at strumming guitars & shaking shakers in time to a mass singalong of Jungle Book classic “I Wanna Be Like You” amongst others. Upcoming artist Casey Lowry then sang for the crowd with his vocals and included some Ed Sheeran covers. Blues/Folk duo Ferris & Sylvester then followed and continued the London theme of the day by singing Waterloo Sunset, followed by a few of their clap-a-long numbers. Marco Frankland from Good Gracious Music Ukulele Workshop then pulled everyone together for a group participation hands-on ukulele lesson to grasp the basics of these tiny musical instruments. Radio Lollipop broadcasted the whole show from Evelina London’s open-plan Atrium throughout the hospital, giving the kids a chance to DJ, request songs and get involved in dance offs with the Lolli-Bear to Gangnam Style & Baby Shark. The day culminated in a cake cutting ceremony which saw founder Hedley Finn share the moment with one of the patients, her dad & her pram on the stage.